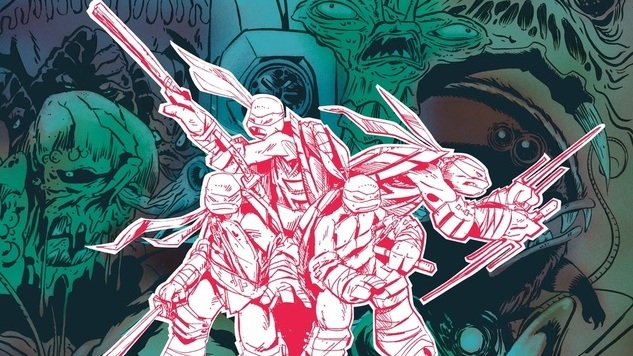 Dark Horse has massively stepped up its art-book game over the last few years—even looping in former Paste talent to do so—and today we can exclusively announce their sewer-dwelling next installment: The Art of Teenage Mutant Ninja Turtles, out April 16th, 2019. Curated and written by executive producer Ciro Nieli, The Art of Teenage Mutant Ninja Turtles serves as a definitive guide to the fan-favorite 2012 Nickelodeon CG-animated TV series. The 184-page hardcover will retail for $39.99 and features exclusive art from all five seasons along with insider commentary and an introduction by Teenage Mutant Ninja Turtles co-creator Kevin Eastman. Check out the cover and official blurb from Dark Horse below. Step into the sewers of New York for a look at the teenage Heroes in a Half-Shell with early concept sketches, beautiful background paintings and glimpses into the innovative CG-animation production that brought their mean, green world to life! Whether it’s exploring the Turtles’ lair, discovering the myth and culture of the legendary ninja and samurai or experiencing the streets of New York City, it’s all presented within these pages of The Art of Teenage Mutant Ninja Turtles.